Junshan Yinzhen hails from Junshan Island in Dongting Lake in Hunan Province. It is a type of yellow tea. Junshan Yinzhen has evenly shaped tea leaves. One side of the leaves is golden colored whereas the other side is covered by a layer of white fur. The leaves are fine and thin, resembling a silver needle, giving the tea its name “Yinzhen”, which literally means “silver needle” in Chinese. Junshan Island is located in the middle of Dong Ting Lake, which is 15km North East of Yueyang (岳阳) in Hunan Province. The island has 72 mountains with various sizes, these are where the tea gardens located. The reason why the tea produced in Junshan Island is good are:Very thick fog generated from Dong Ting Lake ；Low temperature and high humidity environment ；The tea garden is surrounded by various flower trees. 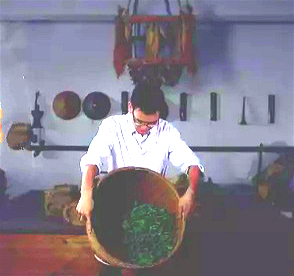 3) Fragrance is called 清香 (Qing-xiang) that is greenish refreshing flavor. 4) Taste is brisk (鲜爽 Xian-shuang), sweet (甘甜 Gan-tian) and mellow (醇 Chun). Junshan Yinzhen has mellow taste with a smooth finish. But like most teas in the Yinzhen family, what distinguishes it is its aesthetic beauty rather than the flavor. In order to fully bring out its beauty in form, the brewing process is especially important. It is best to use clear glass cups. Before brewing, one should warm the glass by rinsing it with hot water. But the glass needs to be dried properly lest the tea leaves absorb too much water, which prevents them from “standing up”. Junshan Yinzhen should be brewed with boiling water. After it is brewed, the leaves will float vertically in the glass. Some will rise to the top while some float at the bottom of the glass. The tea liquor is a mild Ginkgo-hued yellow. 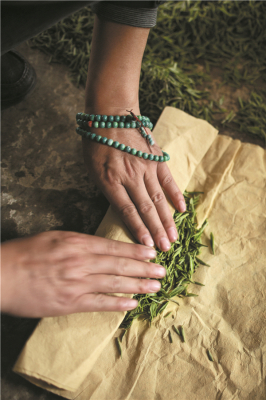 In the history, it was believed that during Tang Dynasty, when Wencheng princess (文成公主) married to Tibet, she picked the Junshan tea as one of her trousseau. Junshan Yinzhen became the tribute to emperor since Wu-dai (五代，the Dynasty after Tang), and continued during Song, Ming and Qing Dynasty. During Tang Dynasty, Junshan Yinzhen was called “Yellow tail leathers” (黄翎毛 Huang Ling Mao), because when brewed, the yellow bud covered with down was standing up in the glass just like yellow pinion. Huoshan Huangya is a yellow tea from Anhui Province in China, it is the Imperial Tribute Tea and dates back to the Ming Dynasty. When steeped the leaves reveal a very peppery and fresh taste accompanied by an unusual green-yellow color of the brew. As with all mostly bud teas the color and fragrance are slight. HSHY is more mellow, soft, less astringent/agressive. It can be drunk at any time of one day, won`t cause any comfort. But because it is not yellowed on purpose , it is close to green tea, so still keep the refreshing spirit. So HSHY has both the same feature of refreshing with green teas; and also the same feature of softness with white teas. Its chestnut & orchid fragrance likes Xi Hu Long Jing more or less.. The process for making yellow tea is time consuming. Here is the process in general, but each of the tea has its own variations. 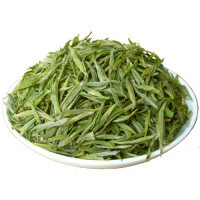 The leaves are first fried, as is the case in most green teas, but then the leaves are wrapped in some kind of material. At intervals the tea is fried again and re-wrapped to cool and oxidize slightly. This process continues for up to three days and then slow roasted at the finish. 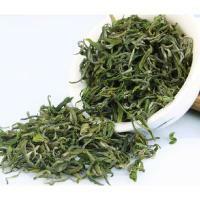 Mengding Huangya is shaped yellow buds of tea produced in Sichuan Province, Yaan City Mengding. shaped yellow buds of tea,especially tender and delicate in its texture. The remaining yellow teas are Jun Shan Yin Zhen from Hunan on Jun Shan island in Dong Ting lake, Meng Ding Huang Ya from Meng Ding Shan in Sichuan, Huoshan Huangya from Anhui,and Mo Gan Huang Ya from Mo Gan Shan in Zhejiang, being the least known and rarest of the yellow teas. .